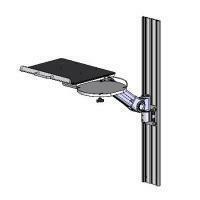 Track mount adjustable tablet PC holder(model #60223K series) - Sallas Industrial Co., Ltd.
Sallas - track mount adjustable platform is suitable to support laptop computer, book, keyboard or other office equipment of its weight within the arm load range. The arm offers side-to-side, up-and-down and platform tilt mobility adjustments. Patented counter force balanced and adjustable friction designed support arm provides personalizing usage for a most smooth and effortless adjustment - without the need to touch any knob or levers. 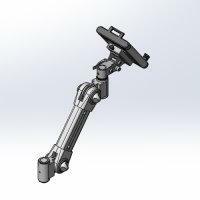 Tablet holder for holding tablet depth from 140mm to 210mm.